I agree with most comments that Giugiaro actually did a pretty poor job on the M1 - certainly on the basic unmodified car. In fact, I'm pretty confident Chris Bangle could do a better job on an eventual successor. With the renewed interest in the F1-company, I'm surprised that everybody seems to have forgotten that the M1-Procar series did indeed get a successor already - with the Jaguar XJR 15. And that one, to me, was a classical example of great, accomplished styling. This is a great car. No doubt about it. It has a great engine and a great look. The best remake that BMW could do to this car is NOT CHANGE THE LOOK'S of it. One of the best remake that i've seen was the Ford GT 40, and that is how the remake for this car shoud be. The engine shoud stay the like the original, a straight-6. Join that a new interior and you have the perfect remake for this car. I read a while ago in a Motor Trend magazine that BMW were indeed working on a successor to the M1. In this other magazine, I forgot which, they said the same thing. They had a nice picture and some juicy info. A V-10 not unlike the one in their F1 car is supposed to power it (with modifications, of course. The F1 car does 18,000 RPM and 800 HP, something not suitible for a road car). I have only one worry about a re-designed BMW M1, and that is... Chris Bangle. BMW really should try and make a modern revision of this car. They could make it to fit in the $150,000 price range, to compete (and blow away) cars such as the F360, 911T and whatnot. I'm sure they could come up with an acceptable body style. Fitted with a strung - out version of the up coming 3.5 inline 6, they could hold onto roots, but I think they would be inclined to put that new 5.5 liter, 500 hp V10 in it, the one thats going to go into the M5 and M6. The best car driven by the best. 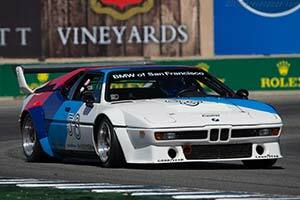 This M1 series was one of the best race cars of all time, if not the best. Its been driven by Niki Lauda, one of the best drivers ever. Some versions of this car had about 600hp, and some had over a 1000. the car is powered by the best engine in the whole world. A straight 6 cylinder. There is no better cars but BMW M models. Thats how it was more that 20 years ago and thats how it is now.